The author did sadhana at many of the 64 Yogini Temples using this Kali 64 Yogini Namavali. Particularly suited to Kaula Marg Tantics, her energy is guaranteed to descend. 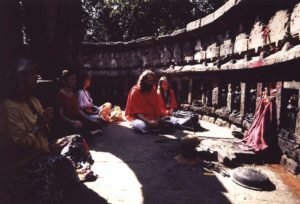 This puja is the well known Hiripur Temple, taken many years ago. Kali is in all forms. She is particularly in the 64 Yoginis, all of whom are extensions of her Cosmic Personality. This Kali 64 Yogini Namavali brings her closer to all those who chant it. First published in 1990, these mantras come directly from Sathguru Babaji. Devotees of the Mother and her 64 forms will be pleased to know that they have been posted extensively in multiple sites throughout the internet. All are welcome to use these sacred sounds which will elevate humanity. For the absolving of sins, clarity of consciousness, a peaceful heart, massive protection, dynamic aura, robust health, and the magnificent grace of abundance of every type, one should chant the sacred names of the sixty-four Yoginis. We should never minimize their potential. They are not minor deities. They are none other than emanations of the one cosmic Prakriti residing over every aspect of the relative plane. They can pull a soul from the lowest depths of illusion into the most elevated heights of grace- light.